H2W Technologies has developed several high torque rotary voice coil actuators, otherwise known as a limited angle torque motors or LATs. The model TWR-015-346-2RC was designed to allow for a low moving mass (68 grams per coil) and inertia, as well as dual independent coils to allow for two independent motion profiles or couple the coils together to double the torque output. 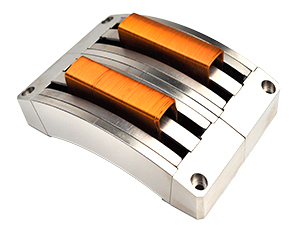 This rotary voice coil actuator can generate a continuous torque of 185 in-oz [1.29 N-m] and a peak torque of 555 in-oz [3.88 N-m] at a duty cycle of 10% (i.e. 1 second on, and 9 seconds off) in each coil on a 4 inch [102 mm] rotation arm. By coupling the coils together, the continuous torque doubles to 370 in-oz [2.58 N-m] with a peak torque of 1110 in-oz [7.75 N-m] at a 10% duty cycle. The TWR-015-346-2RC has a total angular displacement of 15 degrees [0.26 radians] and a motor constant of 34.4 in-oz/sqrt(watt) [0.24 N-m/sqrt(watt)] per coil or when coupled together the motor constant is 48.5 in-oz/sqrt(watt) [0.34 N-m/sqrt(watt)]. The voice coil motor requires 1.33 amps of continuous current per coil and 4.0 amps of peak current per coil to generate the specified forces. The actuator fits in and envelope of 4.37 in [111.1 mm] x 2.99 in [75.9 mm] x 1.64 in [41.5 mm]. The moving coil design ensures a hysteresis free movement as the coil is wet wound and self-supported, and the non-commutated coil allows for ripple-free motion and no cogging. The voice coil actuator has been designed with mounting provisions in the magnet and coil assemblies. This allows for the integration of a bearing system to maintain the clearances between the coil and permanent magnetic field assemblies. The rotary voice coil actuator is ideal for applications requiring high torque and high-speed applications. Examples of such applications are driving a gimbal axis in scanning applications as well as providing stabilizing torques for image stabilization. More examples of H2W’s Rotary Voice Coils are available on our website here.